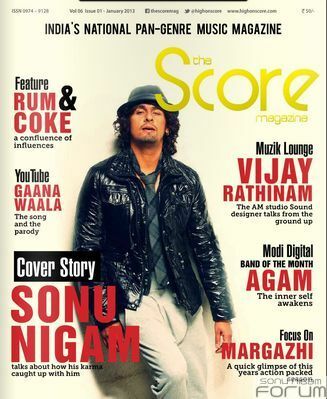 The Score Magazine is India’s only indigenous pan-genre music magazine . The magazine is published for distribution across India and online subscription. It is owned by Score Media Pvt Ltd and is their flagship product, the other being HighOnScore.com. The publication chronicles the various aspects of music and musicians across India. It’s pan-genre and features content from mainstream, indie, Indian classical, pop and international. The Score Magazine states that its aim is to promote good music and help non-Bollywood, indie artist reach a wider audience. The company also organises music events in Chennai, called ScoreNight, and has aims to host similar events in Bangalore and Mumbai.